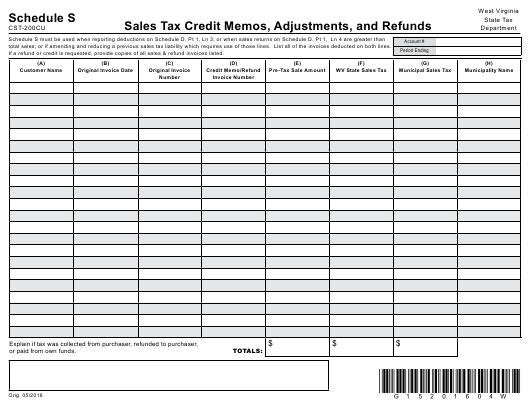 Form CST-200cu is a West Virginia Tax Department form also known as the "Schedule S - Sales Tax Credit Memos, Adjustments, And Refunds". The latest edition of the form was released in May 1, 2016 and is available for digital filing. Download a PDF version of the Form CST-200cu down below or find it on West Virginia Tax Department Forms website. total sales; or if amending and reducing a previous sales tax liability which requires use of those lines. List all of the invoices deducted on both lines. If a refund or credit is requested, provide copies of all sales & refund invoices listed. or paid from own funds.